Dr Ilina Sen’s association with Chhattisgarh and her deep, empathetic understanding of its society and culture have come lyrically alive in "Inside Chhattisgarh: A Political Memoir." Freny Manecksha reviews the book. In November 2000, the state of Chhattisgarh was carved out of 16 eastern districts of Madhya Pradesh. 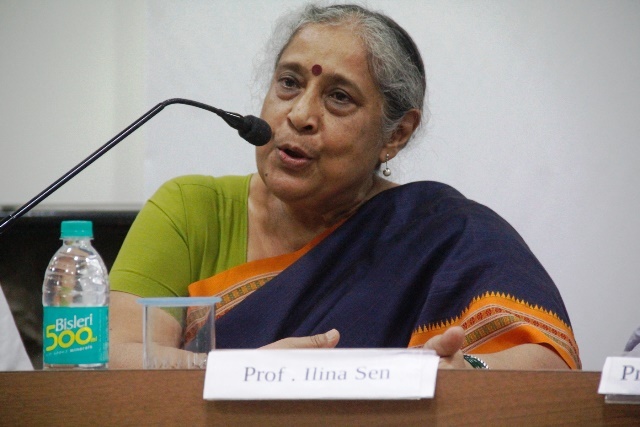 At that time noted sociologist Dr Ilina Sen and her husband Dr Binayak Sen, who had chosen to make it their home and share the lives of its people, had no inkling, perhaps, of how this political act would one day so dramatically impact their own lives. Barely seven years later, Dr Binayak Sen was arrested and charged with sedition. The manner in which he was branded as the “mastermind of the Naxalites” and the case built around him by the state and a compliant local media had a marked impact. For one, it generated a vigorous campaign in defence of the couple’s work while at another level, it raised several important issues regarding the state of Chhattisgarh itself. Several human rights activists and thousands of ordinary citizens protested in India and abroad and questioned the laws on sedition, governance and the role of the state in silencing dissent. The case is still being heard in the Supreme Court and Dr Binayak Sen and Ilina Sen are now forced to live outside Chhattisgarh. Ironically their fate is very similar to those of other internally displaced Chhattisgarhis, who were forced out of their villages into camps or those who fled the state because of repression by the Salwa Judum, the state-created “people’s revolt” against Maoists. Dr Ilina Sen who claims passionately that Chhattisgarh is “an ishq I have not outgrown,” and who proudly sports a tribal bracelet, has sought catharsis in her book, Inside Chhattisgarh A Political Memoir (Penguin Books). It recreates the “bittersweet cocktail” of living through those times. Released last month, the book does not dwell much on the arrest and trial of Binayak Sen. Instead, it is an engrossing account of the couple’s engagement with the land and its people. The personal journey is inextricably linked with a sociological understanding and political journey of Chhattisgarh itself: the working class movements it had fostered and the struggles of the Adivasi communities who had their own unique blueprint of what constitutes development. At the book launch held in Mumbai’s press club, Ilina Sen spoke of the early years in Dalli-Rajhara, the small bustling mining town, where the legendary Shankar Guha Niyogi had attempted to take a labour union far beyond an economic struggle and into the realms of real cultural and social change. It was, she reminisced, a brief shining moment of Camelot, a glimpse of promise and idealism. In the book, the author trains a keen sociologist’s eye to analyse how Niyogi had the ability to marry his ideas with the imagination of the workers to the extent that it was impossible to point out where the ownership of initiative lay. “Between 1977 and 1988, the Dalli-Rajhara workers started 11 schools, built and put into place the Shaheed hospital, created the cultural unit known as Nawa Anjor and discovered the history of Chhattisgarh’s iconic leader in the person of Veer Narayan Singh, besides honing their experience of democracy through the running of the Chhattisgarh Mines Shramik Sangathan,” is how she sums up their achievements. Sen applies the same perspicacious sociologist’s insight to make a critical evaluation of where things went wrong or to observe how power struggles were played out, especially related to gender. Indeed, much of the book’s strength lies in the way she brings in the woman’s perspective, not just through her insights and engagement with women’s issues, but also through her portraits of the women with whom she forged such deep bonds. "I try to hope that I will live again with Binayak in my lifetime"
There are charming vignettes of Chhattisgarhi women – talented, articulate and accomplished public speakers. She writes of the vivid impressions created by these women leaving for work in the mines with towels wrapped around their waist and appearing in the evening market beautifully dressed in cotton sarees and rupia malas (garlands of silver coins). There are also endearing portraits of women like Thalita, the Gond woman who worked for Rupantar, the organization platform created by the Sens and Samaribai, who provided strong leadership to her village. It was through Rupantar that the couple carried out social experiments in the fields of education, health and farming using indigenous seeds. Whilst admitting in an interview with Satyen K Bordolai that a certain romanticism was inevitable in views on the tribal communities of Chhatisgarh, Ilina Sen points out how it is a far more egalitarian society and of how tribal customary laws were often far more liberal than mainstream traditions and conventions. There is also a passage in the book that reveals the sensitivity needed to understand the ways of the tribal communities. The media reported on a particular incident of suicide by a young woman named Kesaribai after she was auctioned to the highest bidder by elders of the community. As opposed to the judgmental stance adopted by the media, Sen chose to study the social norms that had triggered this unfortunate tragedy. She found that it gave a completely different picture. The harras marriage that Kesaribai went through via an auction was the community’s way of finding a partner for pregnant, unmarried girls in cases where the biological father of the unborn child was unwilling to do so. Kesaribai committed suicide probably because she was in love with the man who did not want to marry her despite sexual relations, or because she was out of tune with community traditions, concludes Sen. Such sensitive reading of tribal communities helped the Sens to combine progressive practices with indigenous culture. Sadly, the newfound state failed to understand and meet the aspirations of the tribal peoples. The last two chapters reflect on the metamorphosis that began especially after 2003 when the BJP won the elections with a small majority. Sen describes the saffronisation of urban civil society and the manner in which the cultural narrative of Chhattisgarh was wrested away from tribal and folk lore. There was a growing trend of ‘Hindu-ization’ with sites of natural beauty being linked to events in the Ramayana. The book speaks of the ghar wapasis or conversions, (currently making headlines) routinely organised on a large scale by the late Dilip Singh Judeo, former ruler and parliamentarian from Jashpur and how church properties in Surjuga and Raigarh were systematically targeted through legal cases. Equally disturbing was the way the state earmarked its natural assets as more important than its people. Forcible land acquisition for mining and setting up of various plants were accompanied by the state police unleashing terror on the original inhabitants. A PUCL team, that included Dr Binayak Sen went to investigate human rights abuses and was physically attacked. This was the beginning of the targeting of Dr Binayak Sen and the employment of “anti-development” rhetoric. State violence reached a crescendo in 2005 with the arrival of the Salwa Judum (“sacred hunt” in Gondi). Adivasi society was now split down the middle with the state validating the use of guns by Adivasi youth against fellow adivasis, under the guise of fighting Maoists. The deep polarisation in the state is further driven by the “development” debate. Sen admits there are no easy or quick answers, but wonders why mainstream paths of development find it necessary to demolish older cultures. At one point in her book, Ilina Sen speaks of how Chhattisgarh’s women have the talent to not only sing but also write their own songs and how they once asked her why she doesn’t do so. Perhaps, this book is Ilina’s song to Chhattisgarh: sung in a quiet, measured, reflective, and sometimes elegiac way…..a song that resonates lyrically across its borders to reach the rest of India and beyond. Freny Manecksha is an independent journalist based in Mumbai.